This necklace has a yin-yang charm, garnet, and quartz to help the wearer bring balance to their life. 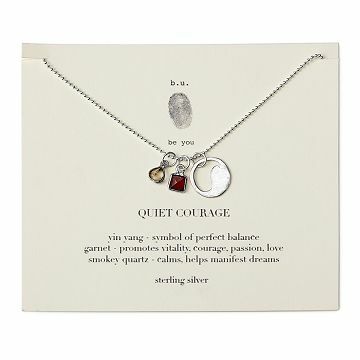 Find perfect balance, love and serenity with Mary Steratore's sterling silver Quiet Courage Necklace. This charm necklace brings vitality and harmony to daily life, as the wearer feels courage from garnet, a calmness and persuasion to manifest dreams in the smokey quartz, and perfect life balance from the yin and yang. This sweet and special keepsake will pull an outfit together and make the wearer feel centered. Comes with a card detailing the meaning behind each stone and charm. 16" chain has extra eye closures for adjustable lengths up to 18". Made in Italy, Thailand, India and the USA. Waxes and molds made Italy, silver charms cast in Thailand, semi-precious stone pieces made in India. The silver ball chains are made in USA and the final necklace is assembled and hand-polished in USA, as well. Due to the natural qualities of the materials, actual stone colors may vary slightly from photo. Lovely meaningful necklace. Could be a bit longer. As delicate and lovely as the picture! I loved the piece and hope my friend does too! I absolutely love this necklace. I received it as a gift last Christmas and have barely taken it off since. Unfortunately, my chain broke at the extension piece, and I lost one of the charms. I am still able to wear it thankfully, but was sad when the chain broke after less than a year of wear. The necklace was exactly what I was looking for! As wished, this will relay to her the love and pride we have for her. She manages life's stresses with her mature qualities. She wears this as a necklace and as a bracelet! My sister loved it! She said it was so pretty and really appreciated the meaning behind it. I think she will love the look of this. The clasp worries me a little -- it's very delicate. Wish it was a little sturdier. I bought some for friends as well, but not sure I will keep them for that reason. Okay for younger people who are used to tiny clasps!